We’re less than a week away from our anniversary trip and I couldn’t be more excited! It seems like time moves at such a sluggish pace from the moment you book your vacation until it actually arrives, but I’m happy to say it’s finally here! 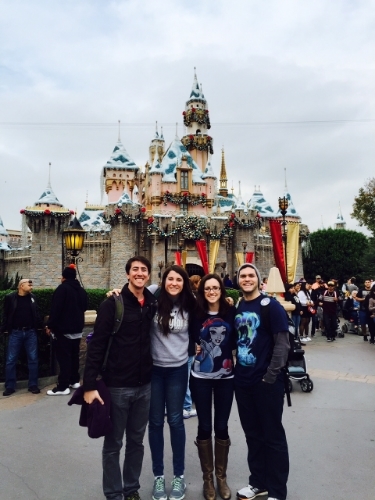 Freddy and I have been to Disneyland many times before, and for the past 3 years we have gone in December (which is such a magical time at the parks) with our 2 great friends Drew and Lindy. This year, I’m looking forward to a) being able to pack some shorts and tank tops this time around, and b) going to the parks when it’s just “Disney” and not another holiday. Don’t get me wrong; I love Christmas time at Disneyland, but for the Diamond Celebration, I’m excited to focus on just that and really take in all of the unique 60th anniversary decorations. Our first year going together--we did both parks in one day, and then decided we wouldn't do that again, ha! Disney take two: the year Freddy proposed! Three weeks out from our trip, I checked Disneyland.com to view the park hours for the days we would be there, and boy am I glad I did! One of the benefits of going to the parks at Christmas time is the extended park hours (Disneyland is usually open from 8am-midnight), which is what I have come to expect every year. However, because we are going during a slower season this year (summer is over; school is back in session), the park hours are shorter, and we will be losing 5 hours of park time. Needless to say I hadn’t really thought this through and I was freaking out a little bit! But, we figured that crowds will be down more than usual since we are going during the week, and we can soak that in and just enjoy the time we have there! Due to the extra morning hours we will have before the park opens, we decided to do a character breakfast on the morning of our anniversary at the Storytellers Cafe inside the Grand Californian Hotel. I haven’t done a character breakfast since I was a little girl, and Freddy and I haven’t done one together, so it will be a fun experience! Let’s be honest: I’m already preparing myself to eat a couple Mickey waffles. This will allow us to fuel up #disneystyle before a magical day at Disneyland! After making trips to the Happiest Place on Earth over the years, we have learned the importance of having somewhat of a “game plan” for the day. I mean, when you’re in a huge crowd of people on Main Street waiting to be unleashed, you can’t just lollygag--you’ve got to be strategic and know where you’re going! That being said, I made up a little cheat sheet (I totally geeked out on this one) for us, so that we know what our priorities are. Items at the top of the list have more precedence, while the rest are key attractions or eateries that we for sure want to hit. I don’t want this to become our “itinerary” in the sense that these things have to go in order, because lets be honest, spontaneity is fun! I just want us to have the freedom to be in the moment and keep track of the things we don’t want to miss out on. Follow along with me on Instagram & Twitter @blushfulbelle to get the inside scoop on our trip! Thanks for stopping by!